Marvin F. "Buddy" Meyer, 89, of New Haven, MO, passed away Monday, August 13, 2018 at his home. Marvin was born in New Haven, Missouri on January 24, 1929, a son of the late Christ J. & Lou Edna (Meyer) Meyer. He was the husband of Norma Lee (Danz) Meyer. They were united in marriage on July 28, 1951, in New Haven, Missouri. Marvin proudly served his country in the United States Army. He was a member of St. Peter's United Church of Christ, New Haven, New Haven American Legion and the V.F.W. He owned and ran BMS Drilling, which he started in 1980. 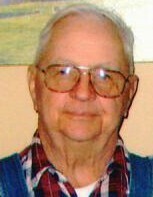 He enjoyed farming, gardening and spending time with his grandchildren and great grandchildren. Marvin is survived by his wife Norma Lee Meyer, of the home, by a daughter, Sharon Marie Meyer, of New Haven; a son, Marvin Douglas Meyer & wife Cindy, of New Haven; a son, Chris Randall Meyer, of Lake Ozark, Missouri; a daughter, Janice Ann Lammert & husband Dale, of St. Clair, Missouri; Nine Grandchildren, Tricia Grannemann & significant other James Gross, Tony Gumper & wife Kristin, Derrick Meyer & wife Hannah, Leslie Lawyer & husband Ryan, Christopher Meyer & wife Brandy, Brittany Kuchem & husband Corey, Crickett Paice & Husband Travis, Courtney Baker & husband Marc, & Aaron Meyer & significant other Haley; by 15 Great Grandchildren, Payton, Mackenzie, Colton, Lexi, Lane, Luke, Kaisyn, Caden, Charlie, Emerson, Lucy, Sienna, Liam, Primrose & soon to join, Theodore, a brother-in-law, Gene Juedemann & many nieces & nephews. He is preceded in death by his parents, two sisters, Madaline Gerdes & Husband Olen and Vera Juedemann, an infant brother; two nieces, Bobbi Ann Baries & Kaileigh Weaks, and a nephew, Kenny Gerdes. Visitation will be held Wednesday, August 15th from 4:00 to 8:00 p.m. at Toedtmann & Grosse Funeral Home, New Haven, where funeral services will be held Thursday at 11:00 a.m., with Rev. David Poe officiating. Burial will be at New Haven Cemetery. Memorial may be given to American Heart Association or St. Peter’s UCC, New Haven C/O Toedtmann & Grosse Funeral Home.